Borla Performance Industries has developed a clever exhaust upgrade for the 2004-05 Jeep Wrangler Unlimited (PN 140103). With great Jeep performance credentials from professional Off-Road to Jeep Rock Crawling Champions, BORLA continues to build performance exhaust that fills all the Jeep lovers needs. Incorporating smooth CNC mandrel bends and award-winning free flowing mufflers allows BORLA to create a masterpiece of advanced engineered exhaust for your Jeep Wrangler Limited. This system is cleverly designed to clear the factory installed trailer hitch with no modifications. Jeep owners are known for durability testing their vehicle and aftermarket components, and this is one reason top Jeep tuners and race teams turn to BORLA for performance, design, sound and endurance. BORLA doesn’t take short cuts. They build it to win Baja or to commute 40,000 miles a year. When you see that polished tip with BORLA embossed on it, you know it is the best you can get. BORLA has a 27-year tradition of building performance exhaust for Chrysler products, from the Hemi to the Viper and Wrangler. 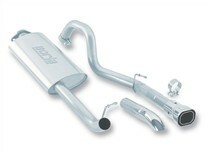 BORLA, the original pioneers of aerospace-grade T-304 stainless steel (superior to T-409 or aluminized steel) free-flow exhaust utilizes its patented award and race-winning technology to deliver quality, sound, performance gains and enhanced fuel economy – all with an easy bolt-on installation. All BORLA street products carry the famous BORLA written million-mile warranty.